For me, if a piece of jewelry is not personalized, then it needs to have a unique design. It has been quite some time since I've come across a jewelry collection that has struck me as truly unique. Jizo & Chibi is such a collection. Valerie S. Johns, the artist behind Jizo & Chibi, was once a resident of Japan. That is where she first discovered these Buddhist characters and began developing the concept for this line, which extends beyond jewelry. Valerie also offers limited edition photographs, watercolors, sculptures, a children's book, and more. Since Jizo & Chibi handmade jewelry can take on a special meaning for a parent and child, I thought some of these pieces would make a wonderful gift idea for Mother's Day. I received the Sterling Silver Standing Jizo Necklace for myself and the Silver Tiny Chibi for my daughter to review as mother/daughter necklaces. 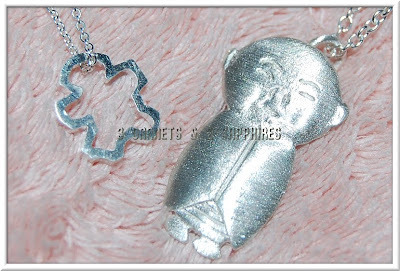 I chose these two pieces because I love the idea of the Jizo holding the tiny Chibi to his chest close to the heart as pictured in the artwork. Of course, any combination of these pieces would take on their own special meaning for you. Jizo: "I am a teacher. I protect all children and travelers and I will be here until all souls are finished suffering. I hold Chibi safe." Chibi: "It means "little one" in Japanese. I can be your own child or your inner kid. " As you can see, both pieces are done in a brushed satin silver. These pieces are available in both the small or larger sizes. They are also offered in 18k gold vermeil and with special accents, such as a pearl or a white topaz. The small pendants come with a 16" chain, but the larger ones offer a choice of a 16" chain or a 16" or 18" long leather cord. I opted for the 16" silver chain. As you can see, although both chains are the same length, the one that accompanies the smaller pendant is more delicate to match the pendant size. The Standing Jizo is actually solid and I am extremely impressed by its weight. It definitely warrants the heavier chain. Since my daughter is only 3, I've always purchased 12" to 14" chains for her. I was worried that the 16" would be too long, but it actually looks perfectly fine and it is much easier for her to keep the necklace from getting hidden inside her clothing. She was absolutely delighted for us to have necklaces that represented our bond as mother and child. 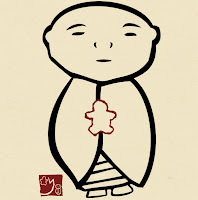 Currently you are able to purchase Jizo & Chibi art, jewelry, and gifts right on JizoAndChibi.com . You can also learn more about this artist by fanning Jizo & Chibi on Facebook and following Jizo & Chibi on Twitter. 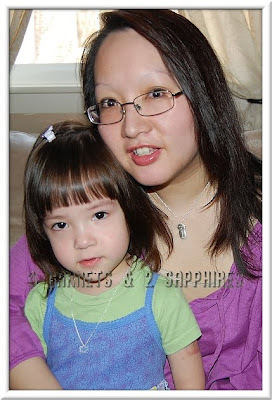 Thank you to Jizo & Chibi for sending us sample necklaces free of charge to base this review upon and for providing another pair of necklaces for our contest prize. 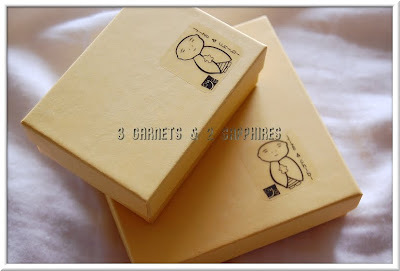 Browse the Jizo & Chibi Jewelry Collection and other gifts offered on this site. Then leave a comment telling me what one item you would love to give or receive as a gift (other than the two necklaces reviewed in the above article). You MUST do this to be eligible to win this contest. 3) For 10 extra entries, blog about this contest linking back to this post AND JizoAndChibi.com . Then come back here and leave TEN separate comments with the link to your blog post. 5) For 1 extra entry each, follow Jizo & Chibi on Twitter and/or fan Jizo & Chibi on Facebook. Then leave a SEPERATE comment with either the link to your Twitter or Facebook profile. If you do both, then you should leave two separate comments. This contest will be closed on Monday, April 26th, 2010 at 11:59pm EST. A random number drawing will be held shortly after. The winner will be announced here and will be contact via email or through their blog. If the winner does not respond within 48 hours, a new number will be drawn.